We offer high quality replacement cushions made from the highest quality Fabrics! 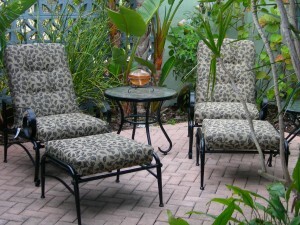 Not only are all of our cushions made directly from the “Custom Cushions Factory!” right here in the USA, they are designed to withstand the worst of conditions for your Martha Stewart outdoor sets from Sears, Kmart, Home Depot, Lowe’s and Walmart and sold at prices below wholesale direct from our factory! We make replacement cushions for the Martha Stewart Pacific Palisades Outdoor Patio Set including the Everyday Pacific Palisades Bar Chairs, Reclining Club Chairs and Ottoman (as pictured).